Seeking LESS STRESS and MORE BALANCE in your life? Sign up for our FREE 21 day OolaChallenge designed to inspire positive change in your life. So the emails come. I am immediately all in. These emails are clicking and light bulbs are going off, and what they’re saying resonates so deep within my being, I can’t keep it to myself. So, I share the graphics on my social media feed. I know others out there who need to feel what I’m feeling. What next? I buy their book. (I am sad to report I haven’t actually read it yet, because I had The Energy Bus from the library at the same time, and I was reading that out loud to my kids, then time got away from me and I haven’t read more than a couple of pages from the first Oola book). I also buy two sets of their Oola affirmation bands. One for me, one for my Mom. Oola is about being balanced in the Seven F’s: Family, Fitness, Finance, Faith, Field, Fun, & Friends. Wondering how ‘balanced’ you are? You can take their Oola Wheel test to see. They start by talking about the seven (F) areas that you need to be balanced in to live an Oola life. Sounds like any other ‘self-help’ book so far, right? Then they talk about the 7 Blockers that keep you from living an Oola life: Guilt, Fear, Anger, Self-Sabotage, Laziness, Envy, and Focus. Reading some of the stories on the ‘blockers’ just punched me in the gut. How often did I let one of the blockers stop me from doing this, or that, or having this, or giving that. Too many times! Then the book goes on to talk about the 7 Accelerators that can help you live the Oola lifestyle: Gratitude, Love, Discipline, Integrity, Passion, Humility, and Wisdom. Once again, the stories made me laugh and made me cry and made me take a serious look at certain habits I’ve created over the past few years in my adulthood. Then when they wrap up what they have to share, they invite you to assess where you’re at in all 7 areas. Then, they give you action steps to set goals in those areas. 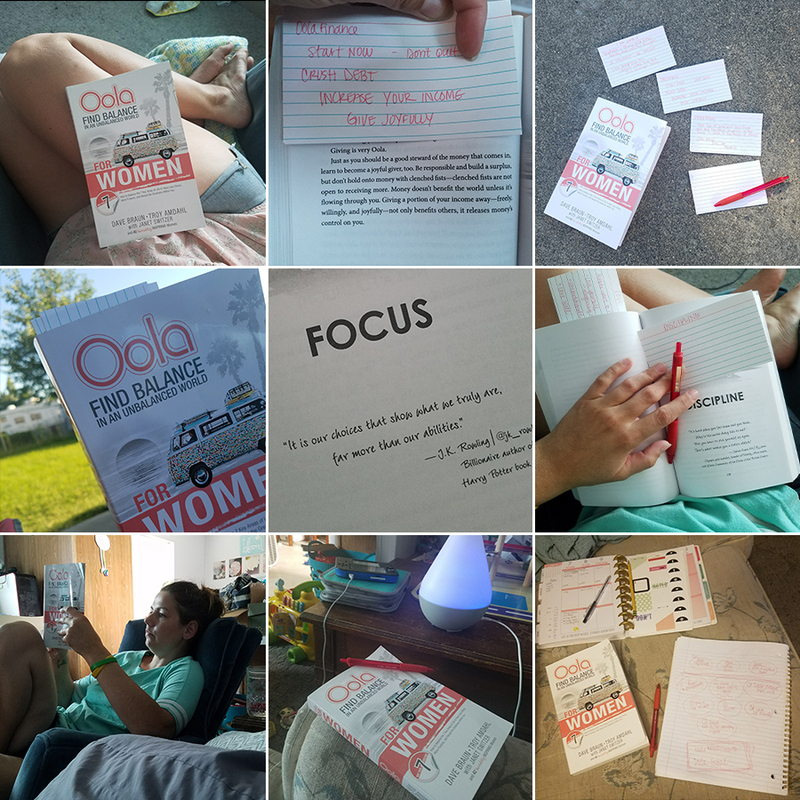 And a very cool thing they have in the back of the book is an Oola for Women sticker, that you can write your big goal on to stick on their VW van when it rolls in your direction. Would I recommend this book to others? Yes. Would I read this book again? Yes. Living an Oola life is something I am going to work on every single day of my life.